Maintain consistent air quality and temperatures with the services for commercial HVAC North Shore business owners trust. 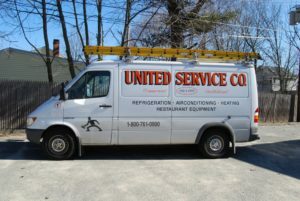 United Service Co. is a certified HVAC company operating in Massachusetts and beyond. Our family-owned and operated business has served locals since 1953. Today, we help our customers with more than HVAC support. We also offer complete refrigeration and restaurant appliance services. The next time you research heating and air companies, look for a commercial business that can meet all your needs. Call today and learn more. Over the past six decades, our business has developed a team of technicians who understand the rapid rate of change in today’s industry. We understand how older commercial technology works as well as the modern technology driving businesses forward. Our services for commercial HVAC in North Shore cover all commercial equipment, maintenance, repair, and replacement activities. Cumulatively, our team offers customers more than 100 years of experience. We will happily look at your current system and recommend either repair or replacement activities. At United Service Co., we understand overhead expenses often eat into a business’s profitability. We constantly strive to reduce our customers’ costs while creating a great air quality experience within the service space. If you need any support for commercial HVAC in North Shore, come to our team of helpful and knowledgeable technicians. Whether you’re staring your new business or growing an existing one, we strive to recommend service activities that fit your needs and expectations. We routinely service systems for hospitals, schools, industrial facilities, restaurants, and other businesses in the area. Our technicians can handle systems including up to 50-ton rooftop units, split systems, ventilation hoods, and makeup air/exhaust systems. You and your employees deserve great air quality to meet regulatory requirements and eliminate health risks. Trust us with your commercial HVAC in North Shore. Read more about our HVAC services. Are you ready for more than basic services from an HVAC company? At United Service Co., we are a one-stop shop for many businesses. In addition to our HVAC services, we offer restaurant equipment support and complete refrigeration services. Our business stocks OEM parts, monitors technician calls, and guarantees the satisfaction of all customers. You won’t find a better service provider for commercial HVAC in North Shore. The next time your heating goes on the fritz during January or your ventilation hoods stall in the middle of the dinner rush, reach out to United Service Co. We look forward to the opportunity to earn your current and future HVAC business. For more information about commercial HVAC, North Shore businesses can call our local office at (800) 761-0900 or (978) 750-5600.